The hearing test should be done by an audiologist. This is a person trained to test hearing and to follow-up with you and your baby. How Do I Arrange Testing? Tell them your baby needs a diagnostic newborn hearing test. Ask if there is anything special that must be done to get the test paid for by insurance. If a referral is needed, call the baby's physician for a referral to an audiologist who is a provider for your plan. Call an audiologist who is a provider for your insurance plan and arrange the test. Call the Division of Specialized Care for Children (DSCC) at 1-800-322-3722 Ask for the phone number of the DSCC office nearest to your home. Call your local DSCC office. Ask for names, addresses and phone numbers of audiologists who can do this test. If you have All Kids or Medicaid, ask the staff to help you find a Medicaid/All Kids provider in your area who can do newborn hearing testing. Call one of the audiologists and arrange a date and time for the test. Call the Division of Specialized Care for Children (DSCC) at 1-800-322-3722. Ask for the phone number of your local DSCC office. Call and tell them you need help paying for a diagnostic newborn hearing test. DSCC can pay for diagnostic newborn hearing tests when you have no other resources. DSCC also pays for medical care and hearing aids for eligible families. DSCC can answer questions, give information and help you get services you and your baby need. DSCC can help you find an audiologist or medical provider who can work with Medicaid and All Kids. DSCC can also help you if you are having problems getting services through your insurance plan. The way sound is sent from the sound source to the outer, middle, and then inner ear. The sound source is usually earphones or a loudspeaker. Sound-field (free-field) testing signals are presented by speakers, usually at a 45° angles from the child who is sitting in the middle of the room. The test may be used to assess the child's hearing with or without hearing aids. Typically, visual-reinforcement audiometry (toys light and animate when the child responds to sound); conditioned-orientation response audiometry (toys on both sides test localization); or play audiometry (various games, e.g., dropping a block in response to sound) are used during soundfield testing. Testing that sends a signal through the bones of the skull by vibrating the bones at a specific pitch and intensity. The sound then goes straight to the cochlea and through the auditory pathways of the brain. This type of testing does not test the outer and middle ear. This type of testing is used to help determine if the child has a permanent hearing loss created by damage to the cochlea and/or auditory nerve or by problems with the outer and/or middle ear which could possiblly be corrected with the help of the physician. A device placed on the forehead or behind the ear that sends sound through the bones of the skull to the cochlea. Constant noise that is presented to the ear that is not being tested to prevent the ear that is being tested from responding to the signal. PTA is usually the average of hearing levels at 500, 1000, and 2000 Hz. The softest level at which a special two syllable word can be repeated at least half of the time. The SDT, also termed the speech awareness threshold (SAT), is the softest level that the child can respond to speech stimuli. Auditory Brainstem Response (ABR) - the ABR, also known as BSER or BEAR, is an objective test that looks at the auditory pathway from the ear to the brainstem. Testing is completed when the child is asleep or sedated. Prior to testing small areas on the forehead and by the ears are cleaned. Then electrodes are placed on these areas. Next small earphones are placed in the infants ears. The earphones present sounds that vary in loudness and pitch to the child's ear. These sounds produce an electrical response from the brain when the child hears the sound. An ABR will show a child's hearing ability at different pitches. Otoacoustic Emissions (OAEs) - can be tested using TOAEs - transient otoacoustic emissions - or DPOAEs - distortion product otoacoustic emissions. This test is often used as a screening measures to see if the child is hearing through the level of the cochlea, the small snail shaped part of the ear. A small probe tip is placed in the baby's ear canal. The probe sends a signal to the cochlea. If the cochlea is working the way it should a echo is measured by the probe. 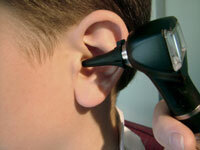 If the child has debris in the ear canal, fluid in the middle ear or a hearing loss an echo will not be measured.